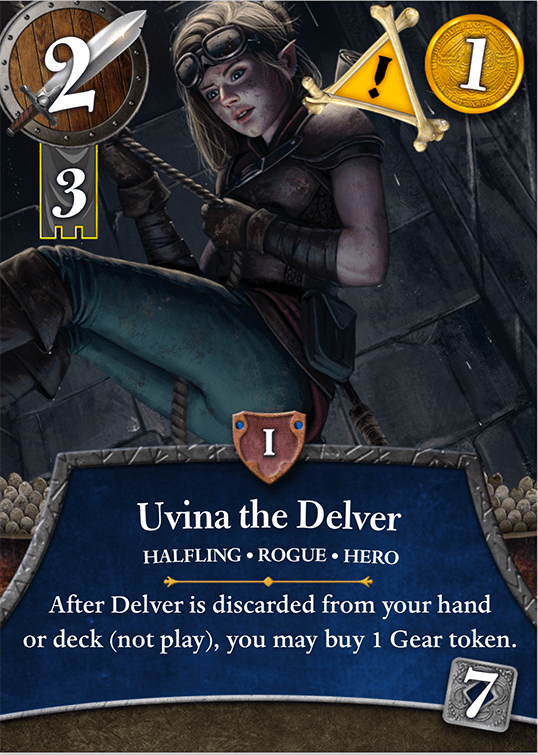 In the first wave of deckbuilders, Thunderstone added on a fantasy/dungeon crawl theme to the mix. About three years (and five expansions) later, a revamped (but backward compatible) Thunderstone Advance appeared. About six more expansions, and as many years, went by and Thunderstone has reappeared as Thunderstone Quest, with an overhaul of some of the game mechanisms and a much stronger thematic componen. Initially launched as a Kickstarter, a second Kickstarter is finishing up with the deluxe version available again, and a new solo/co-op option. As with other deckbuilders, Thunderstone has players purchase cards from a central tableau to improve their starting deck of cards, but it also introduces an area for players to use their cards to defeat monsters for additional points. 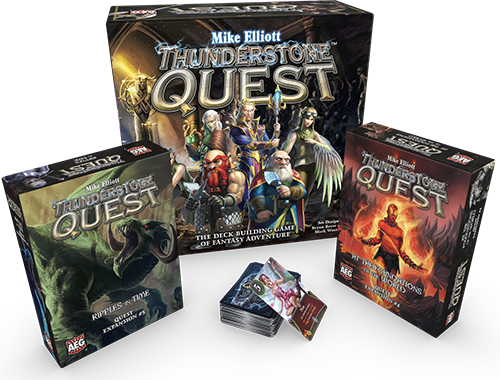 Thunderstone Quest, as the third version of the game, polishes up a few rough edges and introduces a story-based campaign mode to link a series of games together. 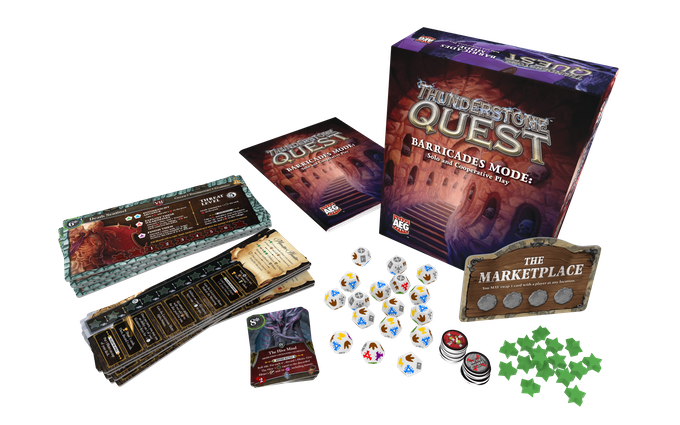 Thunderstone Quest has two major elements: the marketplace (where players buy new cards) and the dungeon (where players use their cards to fight monsters.) At the start of their turn, players choose which area to visit (presumably based on what cards they have in their hand.) In the market, players use the gold totals on their hand of cards to buy new cards (items, spells, weapons) which will increase their combat abilities or their gold income, or both. In the dungeon section of the board, players move their champion token around to select a monster to fight. Players have a choice to make even before entering the market. There are several locations to place a player’s champion figure in the market. Each location gives a small benefit to the market action. The Temple allows you to heal a second Wound (normally you can heal one anywhere else in the marketplace), but you cannot level up a Hero (more on both later.) The Bazaar allows you to purchase one Gear token. Gear tokens are one-use items you can store up from turn to turn and use when desired. Gear tokens come in the form of Lanterns (grant 1 extra light), potions (heal one wound), and Iron Rations (worth 1 gold when shopping or +2 skill to a hero in the dungeon.) The Shop of Arcane Wonders lets you also buy the top card of the Treasure deck (which are quite powerful cards.) The Guild’s Quarter lets you level up two heros instead of just one. If a player enters the Dungeon area, they place their champion figure in the top level (or leave them where they are if they were in the dungeon on the previous turn.) Players may then spend light to move between the rooms in the dungeon. The top level is called the Wilderness and has a default monster to fight during the course of the game to earn some sort of bonus. The rest of the rooms are in three rows of two rooms. Each row is associated with a level (1, 2, or 3) and have a separate stack of monster cards from which to draw. In addition to having a “light cost” to enter, the rooms may also affect the game in other ways – making fights easier, more difficult, or simply different. These rooms are chosen from several possibilities so the rooms can also vary from game to game. Moving between rooms requires one to have light provided by one or more of a player’s cards. This light value is spent in moving between rooms. A player with more light showing on his or her cards is able to move deeper into the dungeon and fight bigger (and more valuable) monsters. Defeat monsters to earn points, treasure, and experience points. Some monsters (or monster rooms) can award players a draw from the top of the treasure card stack. These can be spells, items, weapons, possibly even (captured) heroes to add to their deck. Monsters can wound a player. Typically, the player marks a wound on their player card and every two wounds reduces their hand size by one – making sure most players have to hit the market at least every once in awhile. Some monsters give players Festering Wounds, which are a physical card added to a player’s deck. They can also be healed in the Marketplace. Hero cards are the primary way to defeat monsters in dungeons and defeating monsters will typically be a player’s primary source of points within the game. Heroes provide offense in the dungeon and can use weapon cards to increase their attack. (Weapons are useless without a hero card to wield them.) The experience points from defeated monsters can be used to upgrade a hero card to its next level. Players begin with 0-level Adventurers in their deck, which are generic, rather weak, heroes. However, they can be upgraded to become a level 1 hero of any of the four available hero types that game. Heros can be upgraded to a maximum level of 3. Level 3 heros typically have very strong abilities that can often chain together with the right equipment or other type of card. When a monster in a dungeon room is defeated, the monster is replaced with a card from the appropriate level deck. Within the monster decks are Thunderstone cards. When enough Thunderstone cards are revealed, the game’s overarching villain appears and each player has one turn to try to defeat them for extra points. Once that round is over, players total up their points on purchased (and some hero) cards, defeated monsters, and any extra experience points to determine the game winner. One way the Quest part of the game comes out is through the use of Side Quest cards. At the start of a standard (not introductory) game players are dealt three cards from which to choose a secret Side Quest card to keep for the game. Completion of this quest earns a player a specific, very powerful Legendary card (the only way to earn these cards during the game.) In addition, players choose a Guild Sponsorship at the start of the game, giving a player bonuses relating to one of the four basic class types. 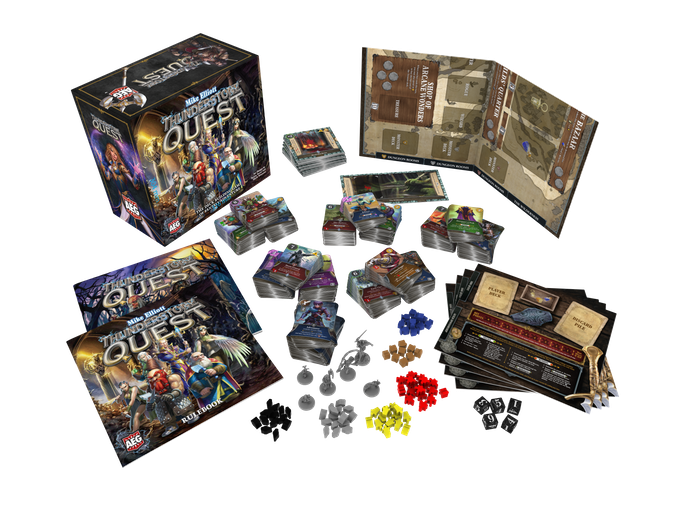 The big concept for Thunderstone Quest is the option of playing through a thematically linked series of “adventures” (games) described in the Quest book. Each game is set up with some flavor text describing the situation and a specified setup for which monsters, items, and heroes will be used for that game. 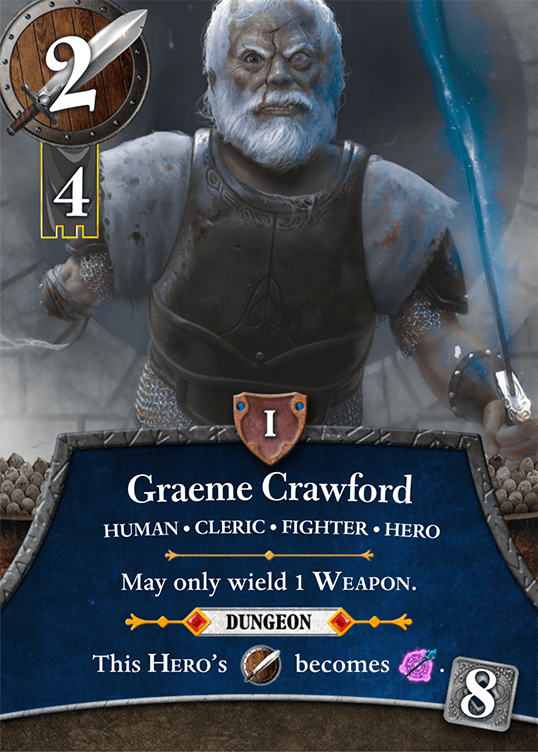 While a “standard” game of Thunderstone would typically randomize the available cards (with some guidelines to keep things balanced) a quest scenario does a nice job of fitting heroes, items, and monsters into a somewhat coherent theme. They have a nice progression of difficulties going from straightforward cards to more complex combinations in later games. The campaign mode of the game could best be thought of as a story arc, rather than a full campaign. Each game in a quest introduces new cards and carries along the flavor text storyline, but they aren’t specifically linked (unless you want to keep track of players’ point totals over several games.) This is very nice, but if people are hoping results in one game carry over to a later one, they will be disappointed. However, the rulebook does provide a way to play a Campaign Mode. Players play a series of games and add their scores to their previous totals. At the end of each game, players are allowed to keep one Marketplace card from their deck to use in all subsequent games. Thus, the second game players have an extra card, the third game they’ll start with two extra, etc.. The rules mention you may want to ramp up the difficulty of the monsters a bit (suggestions are given) for later games if you play a longer series of games. I like the idea, but have a small concern that it might mean the rich get richer – players may not choose the same card to keep as their opponents and the winner of the game picks first. Despite this, I wish it would have also been part of the questing series, but one can’t have everything. The Kickstarter “Champion Edition” (reviewed here) is a beast of a box, containing more than 1300 cards (plus additional bits), most of which comprise the cards for each of the five quest series (about 250 cards per quest.) It has a nifty “lift away” top tray that contains all the bits and pieces, and has a handles to make it easy to get to the many cards tucked into their rows underneath. A more affordable mass-market release will still have around 700 cards (including two questlines.) Currently, a second Kickstarter campaign is under way entitled Back to the Dungeon. It provides gamers with a way of obtaining the Champion edition with the original Kickstarter goodies and introduces a new expansion entitled “To the Barricades!” which introduces solo and co-op play options (which I consider to be very exciting – although there are already some print-and-play versions of the rules available online.) Alas, as with all things Kickstarter, the new expansion won’t be available until early next year. Thunderstone Quest takes the best of the previous two versions and creates a nice coherent system of play that is able to support a (very) wide range of options. The use of light has been reworked, and the way monsters appear and are located in the dungeon has been overhauled. These changes greatly reduce the common situation in the past where the dungeon was full of either unbeatable or simply far too weak monsters to be worth defeating. The new one-use Gear tokens (picked up at the marketplace for spare change) are nice because they prevent particularly bad draws where you find yourself with “extra” gold and can help mitigate poor draws later by providing additional help. The recommended setup has players making careful choices about what cards to use in the various tableaus. The marketplace has 2 weapons, 2 spells, 2 items, and 2 of anything else. The heroes should have at least one hero labeled cleric, fighter, rogue, and thief. The monsters in the dungeon come in three levels and are each shuffled into their own deck (for that row of the dungeon.) Thus, you are spending sightly more time setting up the game (especially if you’re doing a random set up rather than one of the programmed campaign scenarios) in order to have a better balanced game experience. Gamers who disliked the original due to frequent issues inherent with a fully randomized deck of monsters (and/or items) should find this an improvement. Likewise, players who were hoping for a bit more story or context to the original will find a stronger theme here (I particularly enjoy how the dungeon can be a literal “crawl” as you make your way deeper over several turns to fight the biggest bad guys at the bottom.) For everyone else, it probably won’t win over if you disliked the original, but its improvements and campaign mode should be very attractive to new and old fans. 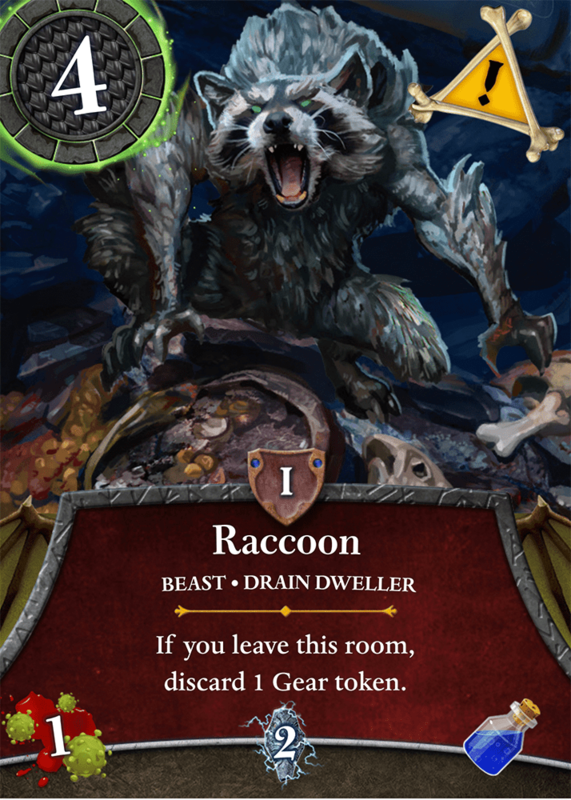 If you’re a fan of deckbuilders in general, it is worth your time to take a look at the new version, Thunderstone Quest. I like it. : Matt C.
I really shouldn’t like this game, as I am not a fan of the dungeon quest them and I tend not to enjoy games where there is tons of text on the cards and one must constantly be reading and deciphering how they interact. Plus, the game is repetitive, and there are often turns where there is little a player can do. That being said, for some reason, I enjoy it. I find it fun deciding on which cards to choose, which path to follow, which actions to take. The wide variety of cards give it a slightly different feel with repeated plays, but I’m not sure if it will have a permanent place in my collection.